Touch Of Belle : Gift Guides for Him! 1. I love these mugs! I am studying photography and think these are such a great idea, they would make a great present for anyone who loves photography! 2. I couldn't not include this, any boy would love this and it would make a great Christmas present idea! 3. Who doesn't love a popcorn?! This way the man in your life can make his own popcorn with his own popcorn machine! 4. This is a clever Idea and one that would impress, just pop some sweets in and your good to go! 5. Don't have room for a full sized ping pong table? Now you don't need to, you have everything you need and you can use your dining room table! 6. I love this idea, I think that anyone boy would love to receive this as a present, they can make their own cameras and then be able to use it after! 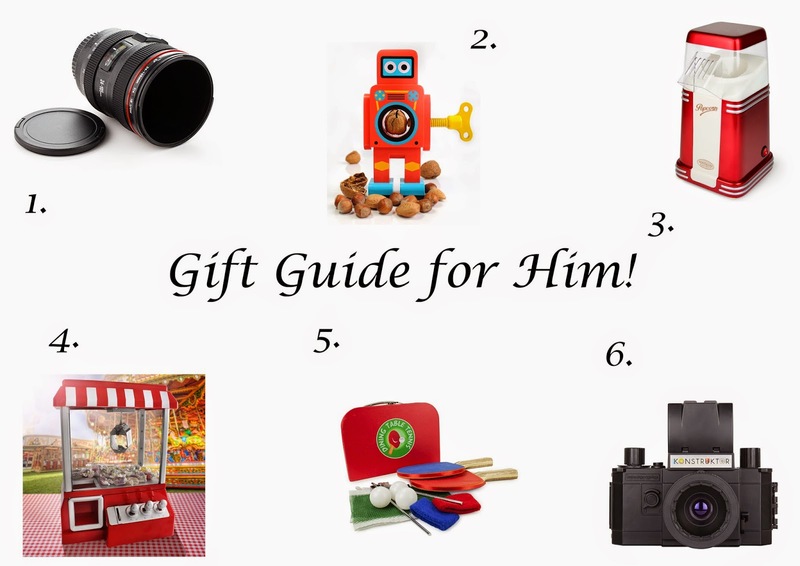 So there is my Gift guide for him! These ideas can be for both male and female and would make great Christmas presents! I love number four - very cute.